Renovated and remodeled ocean front condo. This unit sleeps up to four people with a king bed in the bedroom and a pull out sofa bed in the living room. The kitchen has been renovated with all new cabinetry, granite counter tops, black appliances, surface stove, and fixtures. The bathroom has also been remodeled with a new vanity and shower. The bedroom is carpeted and the rest of the unit is tiled. 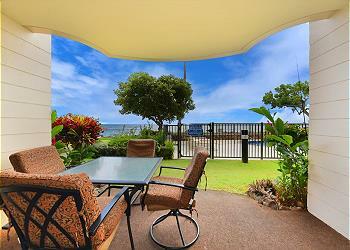 From the lanai you can walk out onto the grassy area or the pool which is right in front of the unit.